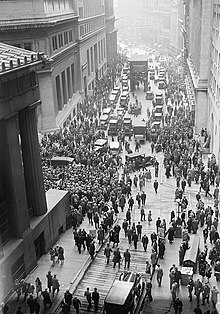 The Wall Street Crash o 1929, an aa kent as Black Tysday (October 29), the Great Crash, or the Stock Mercat Crash o 1929, began on October 24, 1929 ("Black Fuirsday"), an wis the maist devastatin stock mercat crash in the history o the Unitit States, when takin intae consideration the full extent an duration o its eftereffects. The crash signaled the beginnin o the 10-year Great Depression that affectit aw Wastren industrialised kintras. ↑ "Depression & WWII (1929–1945)". Americaslibrary.gov. Retrieved August 12, 2013. ↑ Bone, James. "The beginner's guide to stock markets". The Times. London. Archived frae the oreeginal on May 25, 2010. Retrieved January 29, 2012. The most savage bear market of all time was the Wall Street Crash of 1929–1932, in which share prices fell by 89 per cent. ↑ "Stock Market Crash of 1929". Encyclopædia Britannica. Retrieved January 29, 2012. This page wis last eeditit on 6 Mey 2016, at 17:08.